In 1952 at the age of 65, when most people are looking at slowing down and retiring, Harland David Sanders began Kentucky Fried Chicken. We are fortunate that Colonel Harland Sanders did not believe in the adage that “the future belongs to the young,” or we would likely have never tasted the “finger lickin'” fried chicken we all so much enjoy today. KFC is arguably one of the most widely recognized brands worldwide, and the Colonel is one of the pioneers of modern franchising. Harland Sanders was born on a farm in Indiana. Lying about his age, he joined the U.S. Army in 1906 and was stationed in Cuba. His rank of Colonel did not come from his military career, however. That honorary title was given to him twice, once by Kentucky Governor Ruby Laffoon in 1935, and again in 1950 by Governor Lawrence Wetherby. While not as flamboyant and certainly without much of the drama, in many ways, Harland’s childhood was very similar to that of one of his early franchisees, Dave Thomas, the founder of Wendy’s. Harland grew up poor and needed to become self-sufficient at an early age. Following his father’s death when Harland was only six, his mother’s work kept her away from home for extended periods and young Harland needed to learn to cook and care for his siblings. By the time he turned ten he took a job as a farmhand and, during his life before KFC, he painted horse carriages, was a streetcar conductor, insurance salesman, railroad fireman, blacksmith’s helper, cleaned ashbins on trains, operated a ferry boat on the Ohio River, sold life insurance, sold automobile tires, became a midwife delivering babies, managed a gasoline service station, and was secretary at the Columbus, Indiana Chamber of Commerce. Ultimately Colonel Sanders obtained his law degree by taking correspondence courses from LaSalle Extension University and began a short three-year law practice in the justice-of-the-peace courts in Little Rock, Arkansas. His legal career ended after he got into a fistfight with one of his clients. In 1930 Sanders became a franchisee of Shell Oil Company and, to improve his sales, began to sell chicken dishes, steak, ham, and other comfort food to his customers. His original restaurant was a kitchen table he placed in front of the service station and eventually, he opened up Sander’s Café, his first restaurant, across the street from the service station. Because he felt it took too long to cook, his original restaurant did not start out serving fried chicken.That did not come until later when he developed his secret recipe of 11 herbs and spices and began to cook his chicken in a pressure cooker. I recall Dave Thomas telling me that one of the dangers of the Colonel’s cooking process was that the pressure cookers frequently exploded. Sanders was an aggressive marketer of his restaurant and service station, and his talent and temper landed him in a bit of trouble with one of his local competitors. Sanders began to paint advertising for his service station and restaurant on barns for miles around his location. One of his competitors, Matt Stewart, who operated a nearby Standard Oil station, took exception to the Colonel’s advertising and began to paint over his signs. Sanders went to see Stewart, accompanied by two Shell executives. During the confrontation, Stewart shot and killed Robert Gibson, one of Shell’s district managers and during the fight, Sanders shot Stewart and wounded him in the shoulder. Stewart was convicted of murder, but the charges against Sanders were dropped after his arrest. Sanders successfully operated a motel with an attached 140-seat restaurant in Asheville, North Carolina during the 1940s, but during World War II with gas rationing, the motel and restaurant began to fail. It was in that restaurant that he perfected his secret recipe and began cooking his chicken in a pressure cooker because it was faster than pan frying. The Sanders Court & Café was popular with travelers on their way to Florida through the town of Corbin, Kentucky but when Interstate 75 was built in the 1950s, bypassing the town, Sanders was forced to retire and sell the restaurant. In 1952, living on his $105 a month social security check, Colonel Sanders embarked on his last career. Sanders began traveling across the country, cooking along the way, determined to franchise his fried chicken. Many of the restaurant owners he met laughed at his signature dress of a starched white shirt, black tie, and white jacket and pants. There is a wonderful picture of the Colonel and Dave Thomas both wearing the Colonel’s signature attire. Pete Harman was a friend of Sanders and operated one of the largest restaurants in Salt Lake City. Persuading Harman to begin selling his recipe chicken in his "Do Drop Inn" restaurant was a success, increasing sales by 75%. It was Don Anderson, a painter hired by Harman, who came up with the name Kentucky Fried Chicken and it was Harman that created the original bucket that still exists today. Soon several more restaurant owners signed franchise agreements with Sanders for the princely franchise fee of four (4) cents per chicken. It was during this early period that the Colonel met Dave Thomas. Dave at the time was working as a cook for the Clauss family operators of the Hobby House restaurants. 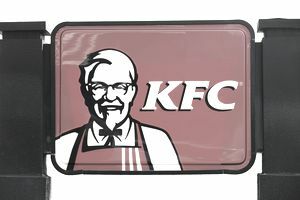 It was Dave who developed the classic wobbly red-and-white striped chicken bucket that became the classic sign outside of each Kentucky Fried Chicken restaurant, and who also streamlined the method of delivery by creating the “snake” line still used today in many restaurants. Against the Colonel’s advice, Dave took over eight failing restaurants and was so successful in turning them around that he was able to sell the restaurants and begin his own chain of hamburger restaurants, named after his daughter Melinda Lou “Wendy” Thomas. By 1964 there were over 600 franchised Kentucky Fried Chicken locations in the U.S., Canada, Mexico, England, and Jamaica. At the age of 73, Harland sold most of Kentucky Fried Chicken to John Y. Brown and Jack Massey for two million dollars, retaining Canada for himself and excluding England, Florida, Utah, and Montana that he had already sold to others. While still its brand ambassador, he and his wife Claudia opened “The Colonel’s Lady’s Dinner House” restaurant in Shelbyville, Kentucky, in 1968. Heublein tried to stop the couple from opening the restaurant and in settling the dispute, Sanders received $1 million in exchange for his promise to stop criticizing Kentucky Fried Chicken’s food and was allowed to open his restaurant. Renamed the "​Claudia Sanders Dinner House," the restaurant was the only non-Kentucky Fried Chicken restaurant to serve a true version of Sander's original recipe. Colonel Harland Sanders died in Louisville, Kentucky, in 1980 and his wife Claudia died in 1997. Kentucky Fried Chicken continues to be a well-known franchise brand, currently ranking #41 on Entrepreneur's "Franchise 500" list, and with over 500 new locations added within the past year. What's Required to Open a McDonald's Franchise?